In this week’s show, we’re winging it. For the main segment of this episode, we thought it might be fun to improvise a whole scenario while on the air. Based on six-word plot hooks that we…er…stole from our forum, we threw together a basic outline for a Gaslight adventure that might just have some potential. We get a lot of things wrong along the way…but that’s what happens in a first draft, anyway. Also in this show, a trip to the Special Collections vault for a peek at the Eltdown Shards, a history “field trip” to British Columbia, and more! • Yog-Sothoth.com is having their March into Madness Patron drive. Paul has a large list of amazing raffle prizes, as well as huge discounts on the Innsmouth House store. • The Achtung! Cthulhu Kickstarter has been stomping all over their stretch goals. They’re about to reach a goal to add a Guide to North Africa and Middle East, and they’ve already started two new campaign guides, Shadows of Atlantis, and Assault on the Mountains of Madness! Who doesn’t want to fight Mythos-powered Nazis in an Antarctic Elder Thing city! • Miskatonic River Press has released Tales of the Sleepless City! This is a New York City sourcebook with a list of adventures from some of the top talent in writing Call of Cthulhu adventures. • Friend of the podcast Joe Broers has released his latest sculpture: Yig, Father of Serpents. Bring this into your Yig CoC adventure and blow your players’ minds. • The H.P. Lovecraft Historical Society has a new audio drama from their Dark Adventure Radio Theatre line: The Case of Charles Dexter Ward. It’s available in download format, as well as CD. I’d advise getting the CD version, as it comes with some amazing props! • The Unspeakable Oath 22 is out! Arc Dream Publishing has released another amazing issue that has some of the biggest names in horror gaming. Now available in PDF at drivethrurpg.com and will be shipping in paperback in a couple of weeks. Arc Dream is looking for submissions for Oath 23. Submission guidelines are at theunspeakableoath.com. • Arc Dream has an ebook edition of the Cthulhu Mythos Encyclopedia by Dan Harms. Perfect for reading all about Y’golonac on your mobile device. It’s on Kindle, Nook, iBooks, and DriveThruRPG. • More Delta Green fiction is available in Delta Green: Strange Authorities and its sequel, Through a Glass, Darkly. They’re in paperback at Amazon and from ArcDream.com, and ebook versions for Kindle, Nook, iBooks, and at DriveThruRPG. We talk about the Eltdown Shards. The episodes of the HP Lovecraft Literary Podcast that cover the story with the boxes and replacing minds begins with episode 108 and goes to episode 110. And now for something completely different. The crew improvised the outline of a scenario based on six-word plot hooks that listeners posted on the forum here. It was too hard to choose only one, so we each picked one from the list. From these seeds, we sowed a weird Gaslight tale of vikings, magical geodes, emergency amputations, heat-seeking alien vermin and malicious subterranean vegetable thralls. And yes, we realized afterward that there were no offshore oil drilling platforms in the North Sea in the Gaslight period. Thanks very much to our official sponsor! We would love to hear your ideas for topics for us to talk about. Send us a note directly, or go to the Campus Forum with your ideas! 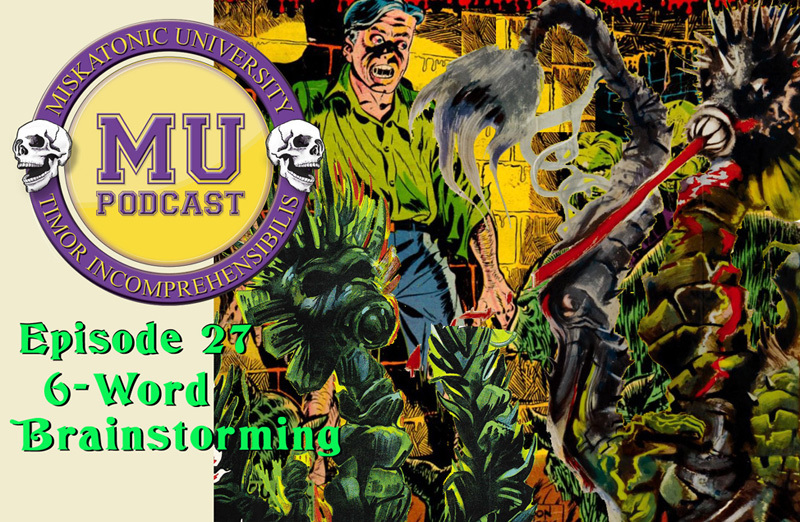 ***Here is the discussion thread*** on the Campus forum, and this is the discussion thread for this podcast posted on the Yog-Sothoth forums.